Ceramics are a novel but increasing area of activity in 3D printing. 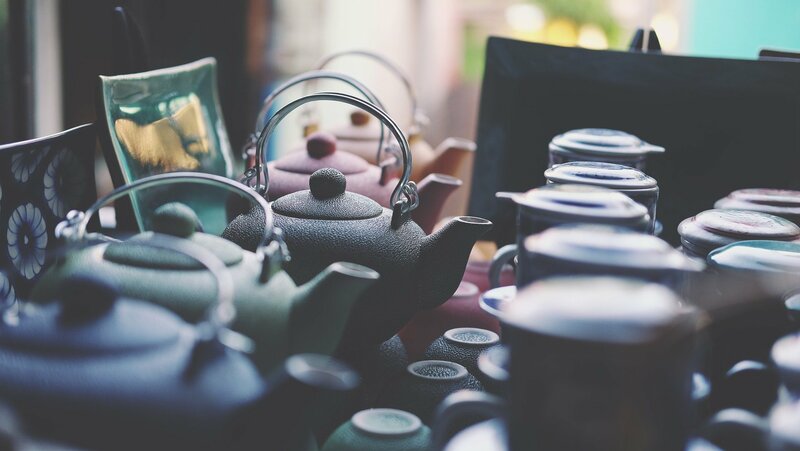 From jewellery and kitchenware to aerospace components and custom-made dentures, ceramic 3D printing lends itself to a wide range of commercial applications. In spite of the difficulties associated with ceramic 3D printing, a number of 3D printer manufacturers have made strides in this field, offering versatile solutions for both desktop and industrial applications. As the market for ceramic 3D printing is a rapidly growing area, we’ve compiled a list of the top 7 ceramic 3D printing systems currently on the market — to help you make the best choice when choosing your next ceramic 3D printing system. Ceramic 3D printing can be achieved with several AM technologies, including Binder Jetting, Stereolithography (SLA) and extrusion-based 3D printing. A 3D-printed ceramic part is typically printed in its fragile green state, meaning that it must go through additional post-processing steps to reach its final form. These post-processing steps include sintering or firing in a kiln to harden the object. Check out our guide to ceramic 3D printing for more information. 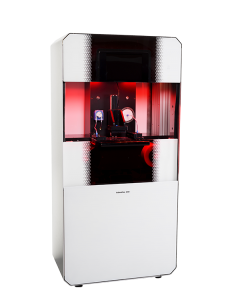 Recently unveiled by Taiwanese company ComeTrue, the M10 ceramic desktop 3D printer is based on the company’s Binder Jetting technology. 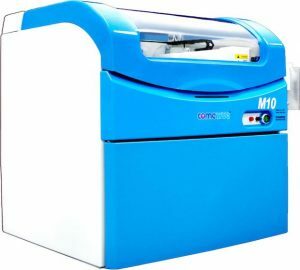 Using ceramic composite powders, the machine can be used for art projects; dental parts, such as dentures; as well as in education and research. With a build envelope of 200 x 160 x 150 mm, the M10 is suitable for producing small batches of complex ceramic parts without the need for support structures. 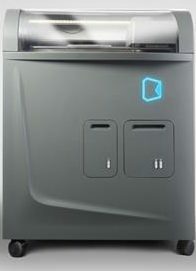 The system also offers a firing kiln, vital for ceramic 3D printing, as an addition. 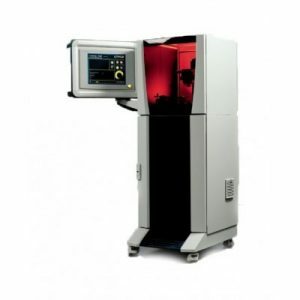 The DeltaBots 3D PotterBot XLS-1 is the latest development in a series of ceramics 3D printers from US-based manufacturer DeltaBots. With a price point of $14,850, this commercial AM system expands the possibilities of ceramic 3D printing to large-scale objects made of real clay. The 3D printer possesses a high-pressure hose extrusion system, and it is possible to print objects much larger than the printer itself. In addition to this, 3D Potterbot XLS-1 offers a high level of accuracy and speed, and can be used to produce customised ceramic products. The Ceramo One 3D printer, a powder-binding ceramic 3D printer, was first unveiled at CES 2018. Kwambio, the company behind the AM system, aims to speed up production of ceramic objects: the machine can reportedly 3D print a ceramic mug in only two to three hours. With a build volume of 350 x 350 x 380 mm, the Ceramo One is an ideal option for creating intricate ceramic jewellery and decorative objects as well as aerospace and healthcare products. This extrusion-based desktop 3D printer from Dutch company Vorm Vrij makes it possible to 3D print two different types or colours of clay in one print run. Compared to continuous flow ceramic 3D printers, users of the LUTUM® DUAL extruder 3DclayPrinter can control the extrusion nozzle, pushing the boundaries of shapes and geometries for ceramic objects. The applications Vorm Vrij’s machine vary from ceramic jewellery and decorative pieces to educational uses in design and architecture departments. Using SLA technology, the CeraFab 8500 3D printer can produce high-quality ceramic products that possess the same properties as conventionally produced parts. Developed by Austrian manufacturer Lithoz, the CeraFab 8500 is compatible with various technical ceramics: for example, LithaCon Zirconia and Lithabone TCP, which are both used for medical purposes. Applications of the printer range from mechanical and electrical engineering to aviation, consumer and medical fields. 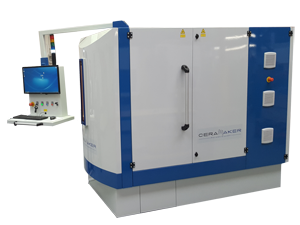 The Ceramaker 900 3D printer from French specialist 3DCeram offers rapid production of high-performance ceramics. Based on the company’s proprietary laser SLA technology, this industrial 3D system works with a range of photocurable ceramic pastes, which can be used in industrial applications from aerospace and medical to luxury industries. With a build volume of 300 x 300 x 100 mm, the Ceramaker 900 is ideal for producing small to medium ceramic objects in short runs. Dutch manufacturer Admatec has developed the ADMAFLEX 130 3D printer to produce technical ceramic components with a high density. This industrial 3D printer offers high printing speeds and reduced material wastage thanks to an innovative material reconditioning system. There is also a wide range of materials to choose from, including alumina- and zirconia-oxide, fused silica, aluminium toughened zirconia, silica-based materials (for investment casting) and hydroxyapatite. Use cases of the ADMAFLEX 130 include casting cores, bone replacement and dental implants, electronics and jewellery.